There’s not much I can add that the video doesn’t say for itself. Stamina still low, of course, and he certainly hasn’t gotten back to a healthy weight overnight, and yet, he’s looking just a bit less gaunt, somehow. In other news… Kama’s foster home is all confirmed and it’s in the last stages of planning his trip there tomorrow, with any luck to a vet for a checkup on the way. He’ll have an apartment to himself, not a cage, and his own temporary human around her classes and part-time job (maybe her boyfriend too – how could he resist this kind of charm?) while he’s waiting for his forever home. So YAY, Kama’s future is looking very bright right now!!! If I tell you I’ve started calling our pretty silver-grey guest Kama, for the Hindu god of love, would that give you some idea of his personality? Or how about this pic, in particular? Friday night, just after dark, I was on my way to the grocery store to pick up some stuff for supper – Jackie had a job interview earlier that day that she felt went very well, and she was tired, and we thought we’d have a bit of a treat to celebrate. In the middle of a large Canadian Tire parking lot bracketed by two of the busiest streets in the city, I spotted a cat trotting across the pavement, ducking under cars and avoiding people. The people were ignoring her. Being me, I couldn’t. I called Jackie to grab our small cat carrier and some treats and come help me. For over an hour we tried to get her. She was friendly enough to let me get very close if I was sitting down and tossing treats to her (man, she LOVES Temptations treats!). Unfortunately, she was halfway under a guy’s car, and he wanted to go, and while he was willing to wait a few minutes, time was ticking. I made a grab for her… and I missed. Skinned myself up a bit on the pavement, but mostly, was furious at myself for losing her. I couldn’t get close to her again that evening. However, while we were chasing her, we met Natalie, who works at Canadian Tire, and who told us that she’s been seen around there for at least three weeks or so, living out of garbage cans, and sleeping in the garden centre tent overnight. We left her a can of Friskies under the corner of the garden centre fence, and I went home to worry about her. Sunday, I dropped by the garden centre and met Natalie all over again, and discovered that the tent will be disappearing after next weekend, leaving no shelter. Natalie suggested that if I could track down a live trap, she could set it up when she closed, and that she’d be the one opening the next day. This led to me scrambling madly to find a way to do this. Now, phones scare the crap out of me, ever since the bad emotional crash that put me on disability. Nonetheless, I ended up calling my friend Joanne who is involved with SNKI, and she passed on my number to the right person in SNKI. In no time, Kendra met me at the garden centre and we talked to Natalie and got everything arranged. Every instinct wanted me to go bring her more food Sunday night, but then she wouldn’t have gone in the trap. So it was a very long night, without a lot of sleep, worrying whether she’d go in the trap or not and how scared she might be – but better scared for one night than living out there! Unsurprisingly, because there are NEVER enough foster homes (foster if you can, please!!! it’s wonderful with the right organization, and saves lives!!! ), SNKI has no openings for her. I can’t keep her long-term, not only can we not afford it but with Cory’s health issues it’s probably a bad idea. Unless we can find her a foster-home or a forever home, I’m eventually going to have to take her to the Humane Society, where she has at best a one-third chance of never coming out. I’m going to be looking for options other than that, and so are other people who care about this poor baby. Sunday night, Jackie and I set up a large dog cage/kennel for her that I’ve used previously: she has a small litter box, a kitty hammock, soft blankets in the bottom, and a heavily-catnipped prysma-mousie to take energies out on. There are blankets over it, down to a few inches from the ground except one open end, to give her some privacy. Clean fresh water in a fairly large ceramic bowl that won’t tip went in at the last minute, along with kibble. Monday morning, off I went to the garden centre when they opened – a few minutes before, actually. Tired and with my anxiety running high, I seriously didn’t know what I was going to do if she didn’t go in the trap overnight. (There’s sadly a reason why I can’t do rescue consistently these days – the whole anxiety/depression combo would send me into another all-out collapse in no time. *sigh*) I ran into Marisa in the parking lot, and Natalie was already there. 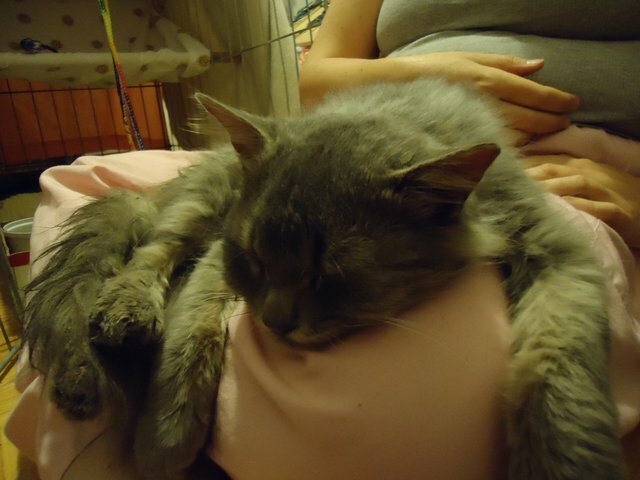 And… so was our little grey girl. Marisa helped me carry her back to our building, which isn’t far away, and Jackie met us at the door. And now, after who knows how long living in a parking lot by herself, with temperatures dropping, and eating what she could scrounge from garbage and what kind people irregularly left out for her… she’s safe and sound. From here, I don’t know what happens. Her cage is in a room alone – yes, I suppose I could let her out of the cage, but then if I need to catch her, there’s the question of how to get her out from under furniture, and realistically, I don’t know what she might have picked up out there. We can keep her for a few days, at least, long enough to get past Thanksgiving weekend and see if we can find somewhere more long-term for her to go. Meanwhile, one more lost soul who was let down by humans is safe and has a future. Pictures to come soon! But she’s a very pretty little fine-boned grey long-hair, no white or stripes that I can see. The narrow face and the build are making me think female, but I could be wrong. Surprisingly friendly, after what she’s been through. Given a vet check-up and a bit of patience, she’s going to be a wonderful companion for someone who’s willing to love her for life. Added a bit later: I went in to gather some laundry, and planned to give her some treats. She was close enough for me to reach through the bars and rub along her jaw; she didn’t respond, but she didn’t move away, so I kept going for a minute. When I pulled my hand back to get some treats for her, she watched… and when I reached back in, she ignored the treats and clearly wanted my hand itself. When I started petting her again, she leaned into it and kept leaning, this side of her jaw and now that side and now under her throat and now her ear. No purr, but every time I pulled back to see if she’d had enough, to let her choose, she moved towards my hand again – not initiating contact, but asking for it. She finally stepped back a bit and I gave her the treats and let her be. How long has it been since anyone has touched that poor baby gently with love? Because it’s very easy for cats to get badly hurt by spending unsupervised time on a balcony, and because my purrkids really REALLY like being on the balcony, one of the first things we did when we moved in was devise an enclosure that would keep them safe. 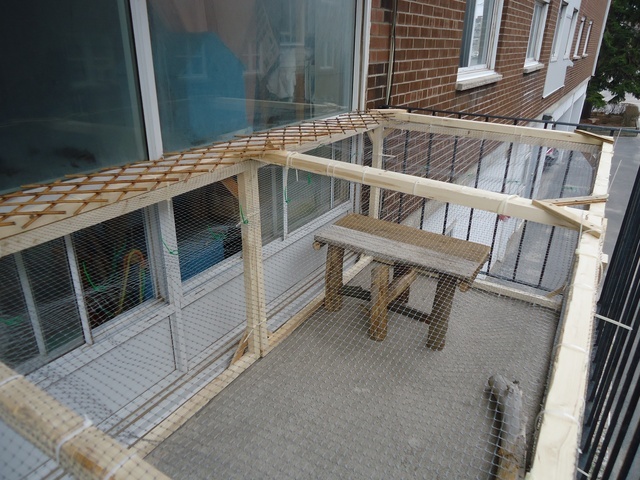 The landlord objected to the full-height full-balcony one, so we’ve gone through a couple of versions that were lower than the balcony railing. That way, through the summer when it’s hot, we can just leave a couple of low windows open and the cats can wander in and out at will, enjoying the cool night breeze, whether we’re watching or not, and still be safe. The most recent one was vandalized to make Angel’s short-lived enclosure in the living room, so I asked my dad, who was going to be coming to visit anyway, to pick up more 1×2 wood for me so I could rebuild it. Being my dad, he couldn’t just do that. Once he had dimensions and knew what I wanted to do, he decided to do a lot of it. Of course, he has proper tools, which I really don’t. 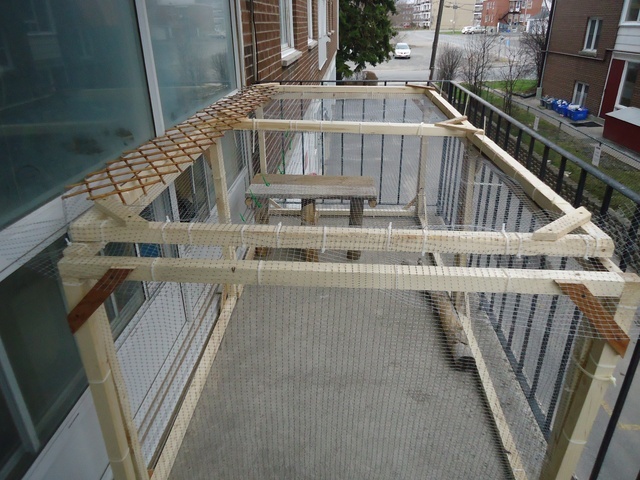 The previous version was an outer panel that was 8′ long by 3′ high, with one support in the middle, and two hinged end panels that were 4’x3′, and a single bar across the fourth side for support, all of basic 1×2 wood, then plastic mesh fencing covering it. It had a couple of openings that I had to devise ways to block, but it worked, for the most part. One thing that I did want to do was change the long outer panel to two shorter ones, so that moving it would be easier – when we had to break it down last fall for the landlord to do some “repairs” to the brickwork, that long panel was a royal nuisance. The new version, however, is a huge improvement. This one is more like 2x2s, and the outer face is two separate panels, which is going to be much easier for moving it when necessary, and there are two more panels on the inner face (but with no mesh so the kids can go in and out the windows) that stabilize it beautifully, and then two 4’x4′ panels that lay across the top as a much more sturdy roof. There are still a couple of possible escape holes, just because the shape of the outer face of the building keeps it all from sitting tightly against it all around, but I can fix those. And we only partly fastened one end panel, so it makes a gate I can use to get in, instead of ungracefully climbing out a knee-height small window to reach them if necessary. On top of that, he made this sweet little 4-legged table thing out of scrap wood, planks that look like barn boards on top and tree branches with bark for the legs and the braces between them, that’s just a perfect size for two cats to perch or one cat to sprawl. A picture says a thousand words, so how about I just show you the pics? Trick helped with showing the scale. PS, a chipmunk lives in that green area between the buildings, often seen scurrying around, and squirrels run along the fence and the top of the retaining wall, and birds show up frequently as well. We aren’t allowed to feed them anymore, sadly, but the kids find entertainment anyway. These pics are of Cory in the “cradle” position from the YouTube video I linked to in the previous post. He isn’t staying in it all that long; I think he’s still getting used to the idea. 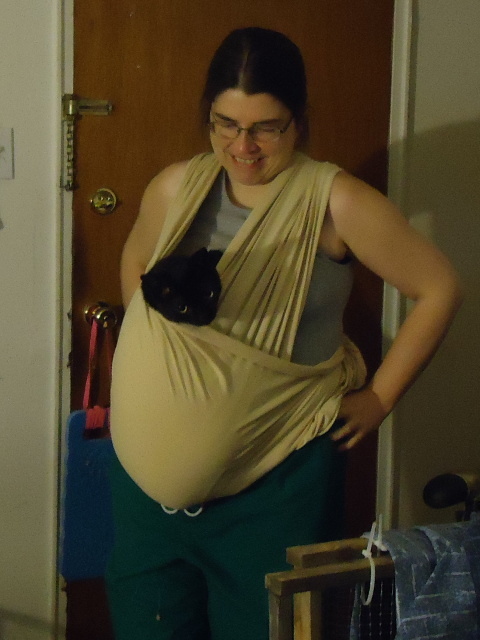 However, he doesn’t resist while being tucked inside, and he’s certainly smart enough to have figured out what I’m doing. Once he’s settled securely, he starts to doze off, even if he’s visibly trying not to. He can be startled awake by noise or motion close to him, but then the eyes start to drift closed again. I think it’s helping. He still obviously misses his momcat, but lots of cuddling and proximity and the other purrkids are all, I think, helping him get through this. So. Pics. Sorry if they’re a little dark in places, our living room isn’t ideal in the evening; the slight blur is ’cause I keep finding myself rocking from foot to foot, since Cory seems to like me in motion to some degree. Nothing through the night, although we were each up at least once and quietly checked on her. A small mess shortly before the alarm but nothing NEAR the horrible smell of the earlier ones (although strongly blood-tinged, I’m sorta running on the assumption that the sheer severity of this caused some tearing near the opening that will heal once things are normal). She was awake and alert to greet us, and once I got her cleaned up, Jackie tells me she was VERY interested in what I was doing in the kitchen and was actually tracking Trick nearby which she hasn’t bothered with the last couple of days. A bit more tuna water, a bit of junk-food Friskies shredded turkey-and-cheese (or at least a bit of the gravy). She’s currently strolling around the apartment, being closely supervised, and stopping to lie down for a minute every 10 or 15 feet – sniffing everything, had a drink from the other fountain. When I cleaned up her room, I did NOT have to swap out the blanket and the top level of bedding from her den, just a couple of tiles and the puppy pad next to the litter box. I don’t want to hit her system with too much Immodium, and it seems to have helped a lot. If she’s still showing any signs at all after 24 hours, I’ll give her another quarter of a tablet. Meanwhile… I’m almost scared to breathe, in case, but maybe the worst of the reaction is finally over? Stupid interwebs went down for a bit. Less than an hour after I said, that, she did have an episode – srsly runny, but then, there’s nothing solid IN her to come out. Didn’t have that horrible indescribable smell that it had earlier, at least, and didn’t have to swap blankets or anything, so that’s still an improvement. We debated a bit and then decided to not wait and to give her another quarter tablet now. Like last night, after maybe half an hour she threw up some acid, but no sign of the pill. So, two steps forward, one step back, but still an improvement. She’s still unwilling to eat. She’s thrown up once more, a bit of acid, nothing else. I’ve used a 10cc oral syringe to, um, encourage her to get some roughly 50-50 water-gushifuds into her twice now (she’s actually SWALLOWING maybe 7cc at a time), which she is NOT liking but there’s just nothing in her stomach except acid and aside from needing to start eating before her liver fails or something, there’s nothing to counter the acid either. I’m a tad uncomfortable with combining Pepcid with Immodium. I got another maybe 7ccs of 50-50 water and Fancy Feast beef pate into her in early afternoon. A couple hours later, more vomit, just acid. Nothing in the litter box all afternoon, and I do mean nothing. Not interested n the tuna water any more, other than a couple of half-hearted licks. A little more leaking diarrhea a couple of times. Over 3 hours ago, we went in search of kaopectate (no salicylates) and gave her 2ccs (followed by roughly an equal amount of tuna water to chase it down, because she wasn’t thrilled about swallowing. Since then, more leaking, and more vomit. I syringe-fed her a bit more 50-50 wet food, this time liver and chicken FF pate, in hopes of getting just a little something in there to balance the acid. Right now, she’s lying between her litter box and her den, facing the wall. She’s purring to herself – we’ve made jokes for years that the switch for her purr is stuck in the “on” position – but something about it doesn’t sound right. I’m sitting with her, where her blanket is in the pics – had to pull it out to wash, and haven’t replaced it. I’m not entirely certain she cares. I’ve been doing things to her she doesn’t like ever since Tuesday, and things just seem to keep getting worse. I want to hold her, but she doesn’t want to be held. Maybe I can get her comfy on the couch instead of the foam tiles and lie down next to her. I’m finding myself right on the edge of tears and it isn’t fatigue or frustration. Something is very very wrong. I can’t tell whether it’s instinct or anxiety screaming at me that we’re losing her. I’m sitting in her room with her right now, so she has some company. Even if we could afford the local after-hours clinic – and we might be able to cover the office visit and a little more but not much – they know nothing about her history or her, and the rather long cab ride there would be a nightmare. Twelve hours less fifteen minutes until my regular vet opens and I can request an emergency appointment, and they’ll get her in ASAP. I love her, it’s breaking my heart that she’s suffering, and I don’t know what to do to make it any better instead of even worse. Poor Jackie’s never really lived with furkids before, this is relatively unfamiliar ground. She’s worrying about me too. Dunno how to tell her about how I get with purrkids in crisis: everything else no longer matters, everything else just shuts down. I made her go play with Freya, who always has too much energy, and the other three kids all know something is going on. I’m expecting this to be a very long night, and I’m glad I had a nap this afternoon. Morning update: I got up once in the night to visit the bathroom and checked on Angel quietly – not visible and no mess, so I let her be. Jackie was up around 6 and went to the kitchen, and Angel started purring on sight so she stopped to spend a little time in Angel’s room with her. Still doesn’t want to be touched much, but she obviously wanted the company. No mess. When I got up at the regular time (just past 8), she’d managed to make a minor mess but not a horrendous one. We put her on the folded-out couch with Jackie and she had more tuna water and a little wet food while I gave her room a thorough cleaning. She started getting restless around the time I finished, so we settled her back in (after Cory inspected my work) and she’s lying on her blanket, NOT hiding in her den, relaxing and watching the world. For such an independent cat who has firm boundaries about what she’ll tolerate, she really hates being by herself. By choice, she catnaps in the same room as one of us normally – only interacting sporadically on her terms, but nearby. I think that’s her only beef with her room, really. She’s very strong, she could destroy that mesh wall if she chose, and I suspect she knows that, but she’s going along with it – probably because through the day she can hear Jackie on the computer only a few feet from her, and we’re both making sure to talk to her a lot and cuddle her when she can tolerate it. Time to see if I can tolerate any breakfast myself, then head to the store for meaty baby foods and some wet food we don’t normally buy ’cause it costs a lot and she just laps up the juices, but right now, I’m good with that! Her poor back end just got a further clipping. Her skin’s getting irritated, so I put some polysporin on it – she can’t reach the spot properly to lick it off, and maybe it will soothe a bit. She’s being cranky about it but not all-out attacking or fighting the way I know she can, so maybe even though she doesn’t like it, she knows it helps? Probably far TMI, sorry, but my Angel-worry’s been jacked up a bit higher. *sigh* Super-watery diarrhea is bad. Super-watery diarrhea with (fresh) blood colouring it, that just sorta leaks instead of coming more-or-less in the box, that’s worse. Maybe. At the very least, the area under her tail is a painful mess. Since it’s distinctly red blood, not darker, I don’t think it’s from way up her GI tract, at least. She’s managed to foul a bowl of food she clearly wanted to eat more of and just missed the interior of her fountain (caught the outer shell tho). Vet closes in about an hour until Monday morning. Already called and asked my vet to call me please before she goes. After-hours clinic is 1) much farther away, 2) much more expensive and 3) knows nothing of her history. Aargh. Just… aargh. Okay, my vet just called back – half an hour past office hours. She was dealing with an emergency. I’m trying to remember that there are peeps whose furkids are going through worse than Angel is, but it’s hard at moments. Anyway, she’s concerned by how long this is lasting and how severe it is (honest to CC, never seen diarrhea this bad!). Also is worried about her blood glucose going crazy high, so we need to watch for that and try to get a reading as soon as she’s going to let us without removing a hand. She says to give her Immodium, 1/4 of a 2mg tablet, to see if that helps stabilize things a bit. Generally giving human meds to cats makes me cautious, and that she didn’t suggest it yesterday makes me certain that it’s not something to use casually, but it’s worth a shot. I’m not sure how much longer her body can tolerate this, and if nothing else, she’s absolutely miserable. She’s trying so hard to keep everything in the litter box and it’s just not working, and her bum’s sore as heck. Jackie’s already at the store to get the Immodium – I’ve been out twice already today, plus I promised to do the laundry, but I think I’m going to be doing a run to a different place to get more cheap tuna (we cannot possibly eat all the tuna we’re using the water from, which makes part of me cringe but I bet the crows are gonna like it). Then: Okay, she’s had her pill. Man, she’s one powerful cat, even when she’s not feeling well. 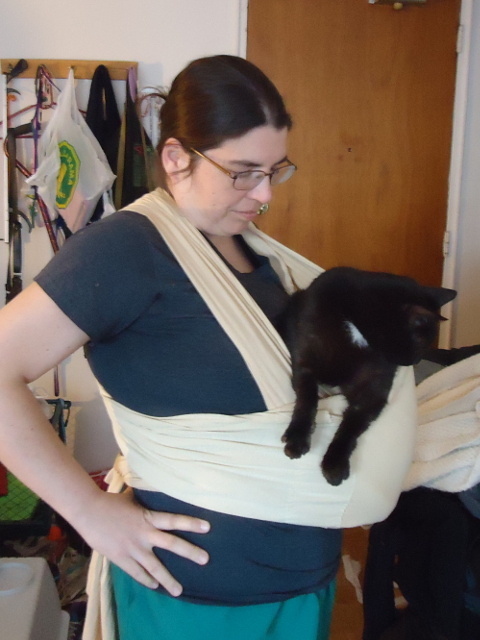 I’ve pilled cats a time or fifty and I know how to do proper restraint, and it still took both of us and some semi-burrito’ing with extreme care not to hurt her hind leg and a painful bite on my hand (no blood) to get a single pill in a pill-pocket treat down her throat. Whew! Now we all cross fingers that it actually helps. We got more tuna water into her afterwards to chase it. So, it’s coming up on bedtime. What’s the current status? A further hour later, as I’m turning off my light to sleep, she’s still in her den after a bit more tuna water. Guess we’ll see what night and morning bring!